It is no secret that kitchen remodels make for higher home resale values, engaging spaces and happy chefs. But while kitchen remodels offer a larger return on investment than most other remodels, the costs can be overwhelming. Even minor kitchen remodels can sneak over your budget limit if you aren’t careful. Thankfully, there are plenty of ways to do a kitchen remodel on a budget without sacrificing style. First thing’s first: don’t move the big stuff. If your renovation requires the plumbing to change, your project is going to get expensive quickly. Keep pipes in place and you’ll save thousands right out of the gate. Butcher block wood counters are less expensive than granite, but are subject to frequent stains and burns. Waxed concrete counters have a classy modern-meets-retro look and will save you a load of money. If you must have the look of granite, but don’t want the price-tag, consider laminate patterns which have come a long way. When it comes to additional countertop beautification options, copper and other recycled metal materials remain popular for backsplashes and wall finishings. Even more savings can be found in using metal-pattern laminates instead of the real thing. Flooring is another important aspect of kitchen remodeling that can help you to cut costs if you select a durable and affordable option. Laying down a new wood floor in the kitchen can make the whole space seem cleaner and brighter. One of the first items renovators look at is cabinetry. New cabinets and alterations to existing storage space can eat a big chunk of your budget fast. First, consider a fresh paint job and new hardware. If you are replacing the cabinetry, remember that custom will cost you. Prefabricated cabinets will save hundreds of dollars per linear foot, compared to custom cabinets. If you need a custom touch, almost anything can be turned into new handles and pulls for opening drawers and cabinet doors. Custom cabinets can be a very good investment, as quality cabinets are always seen as an asset by potential home buyers. Not only that, but, if a kitchen is fully remodeled, they tend to suit the overall theme of the space better. If you want to retain storage space with a new kitchen cabinet vibe, open shelving is a growing trend. There are nearly limitless options for creative shelving, from glass to dolled-up 2x4s. Lighting is an important factor in most kitchen remodels. Track lighting and pendant lights are inexpensive and simple to install and they can change the atmosphere of your kitchen in just a switch flip. It may not seem like an obvious first choice, but it can be one of your most impactful steps, to achieving an affordable kitchen model. If you start to get overwhelmed thinking of all the potential projects you might want to do in your next kitchen remodel, remember this: It never hurts to do a large job in small stages. By making smaller investments as you update your kitchen, you can be sure that you get the most out of your money while completing your budget kitchen remodel! 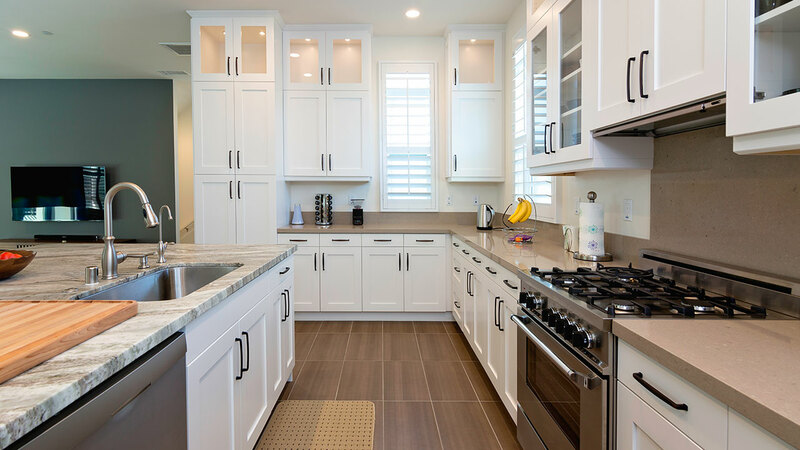 If you need assistance getting your next remodel started, contact the experts at Mid-City Lumber to ensure that your dream kitchen becomes a reality.